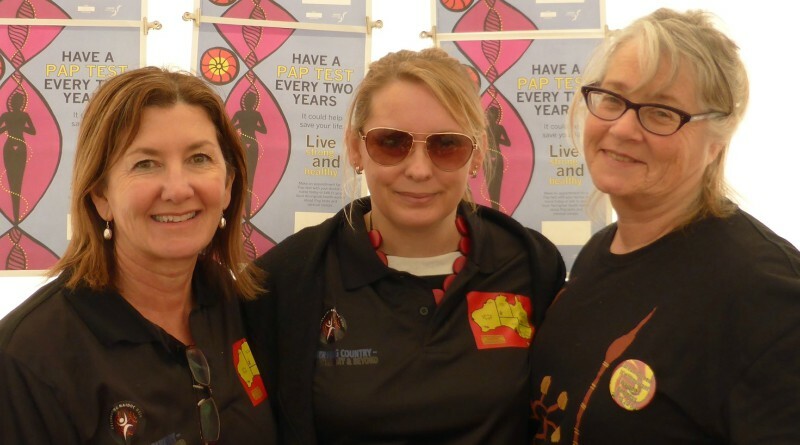 WSLHD Sexual Health staff Arlie Rochford, Karen Biggs and Women’s Health Coordinator Kate Lamb at the Health Tent. Western Sydney Local Health District (WSLHD) is celebrating NAIDOC Week with multiple events at our hospitals and offering health information and screening at Riverstone Neighbourhood Centre. The events highlight the important role that women play within Indigenous communities. WSLHD Aboriginal Health manager Belinda Cashman encourages everyone to attend at least one or as many of these celebrations as possible. “NAIDOC Week is an opportunity for Australians to recognise Aboriginal people and their culture,” Ms Cashman said. “Staff from our Aboriginal Health Unit and health professionals will be available in our Health Tent at the Riverstone Neighbourhood Centre for a NAIDOC celebration on July 12. “They will talk to people about their health and provide them with information on how to access our services. “The Health Tent will test blood pressure, sugar and cholesterol levels will also be checked as well as flu vaccinations. The participants will receive an assessment sheet which can be given to their GP during their next visit. “Our hospitals at Blacktown and Mount Druitt have one of the largest Aboriginal communities in New South Wales, with more and 45 nations represented,” Ms Cashman said.